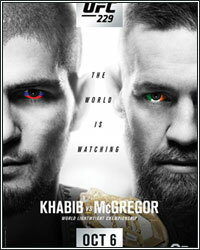 Unfortunately, several melees broke out after the conclusion of the bout, with Nurmagomedov jumping out of the Octagon to go after McGregor teammate Dillon Danis, and a member of Nurmagomedov’s camp punching McGregor. With the win, Nurmagomedov moves to 27-0. McGregor, who was in the Octagon for the first time since November 2016, falls to 21-4.